This collection is the latest in a series of Research Handbooks from Edward Elgar, sitting alongside the likes of the Handbook on Constitutions and Gender, reviewed in Gender & Development in 2018.¹ Like the editor of that handbook, Juanita Elias and Adrienne Roberts have amassed contributions from an impressive array of scholars, who cover a range of topics, to make a crucial intervention into an area of study² that still systematically marginalises gender. 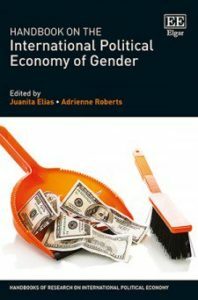 In one of the most egregious recent examples, none of the 47 chapters in Oxford University Press’s 1,000+ page Handbook of Political Economy focuses on gender, and neither is gender listed as a main index heading.³ In this context, there is no question that Juanita Elias and Adrienne Roberts’ gender-focused resource is sorely needed. The breadth of coverage offered by the 34 chapters is a key strength of the collection. As the editors explain in the introduction, they aim to showcase the diversity of scholarship on gender and international political economy, and they achieve this in a variety of ways. The topics covered include those one might expect to see in a gender and international political economy text, such as development, microcredit, trade, care, and social reproduction, alongside issues that have been less prominent in some circles such as prisons, the global beauty industry, and the private security sector. I found Jacqui True’s account of how an international political economy perspective allows us to analytically connect structural violence and inequality with interpersonal violence especially useful in pinpointing the value-added of a gendered political economy approach. They instead offer a wide assortment of perspectives. For example, while providing a useful overview of feminist engagements with mainstream political economy and international relations scholarship, the handbook is refreshingly multi-disciplinary; I especially enjoyed the chapters that covered debates in queer studies (Nicola Smith), post-colonialism (Sheila Nair), and alternative economies (Katherine McKinnon et al.). Likewise, Lucy Ferguson’s chapter, offering a dual academic- and practitioner-focused account of gender training, offers practical recommendations alongside a promising future research agenda, and it will be useful to more action-oriented readers. The collection also showcases a mix of senior scholars offering broad, state-of-the-field overviews (e.g. Spike Peterson on the masculinism of both orthodox International Relations and heterodox political economy; Shirin Rai on development; Meg Luxton on social reproduction, Brigitte Young on financialisation; Stephanie Wőhl on the state) alongside more narrowly focused chapters, some of which present original research in more of an article format (e.g. Stephanie Redden’s analysis of Lefebvre’s work on the everyday; Catia Gregoratti’s and Sydney Calkin’s respective analyses of the business case for gender equality). These chapters will be useful for different purposes, and audiences, and it is helpful that they are included together in the volume. This wide range of topics notwithstanding, the editors do recognise the limitations of their handbook exercise. Even with 34 chapters, they cannot cover everything, and they note the absence of key topics such as the environment. They also acknowledge that the collection is dominated by authors based in the global North, despite the fact that scholars and activists in the global South generated much of the foundational conceptual and empirical work upon which feminist international political economy now rests (including early analyses of debt and austerity). A further weakness of the handbook is that it is structured in a rather confusing way. While Part 1, on theories and approaches, works very well in introducing the reader to major debates, Parts 2, 3 and 4 (on engagements and perspectives, governing markets and economies, and the political economy of people and things) are not well delineated, and overlap significantly. It would have been helpful to have a more coherent logic governing the ordering of the chapters. Finally, the collection is uneven in its attentiveness to history. While some chapters do a fine job putting concepts, movements, and debates into historical perspective (e.g. the chapter on financial crises, written by the editors), the book would have benefited from some feminist historians to inform our contemporary gendered accounts of trade, migration, slavery, and care chains. That said, however, the book is an invaluable – in fact, unique – resource for those interested in gender and international political economy, and the range of work it showcases is useful for both teaching and research purposes. 2. Political economists study the interaction between politics and economics. Although much mainstream political economic analysis is conducted at the state level, there has been growing attention to the international and global dimensions of political economy since the 1970s. 3. Barry R. Weingast and Donald Wittman (2008) The Oxford Handbook of Political Economy, Oxford: Oxford University Press. 4. Clare Hemmings (2011) Why Stories Matter: The Political Grammar of Feminist Theory, Durham, NC: Duke University Press.